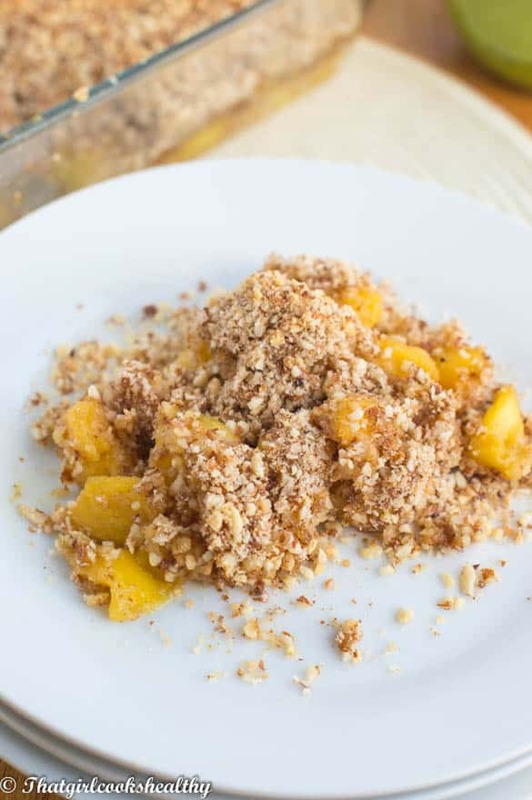 Pineapple mango crisp recipe – a grain free tropical fruit dessert made from mangoes, pineapple, ginger with a shredded coconut and almond topping. 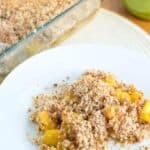 I’m rolling out the big guns with this pineapple mango crisp recipe. How this one came about was purely by accident, you know where you throw a few exotic fruits together in a bowl and magic happens? Well that’s what took place with this dessert. 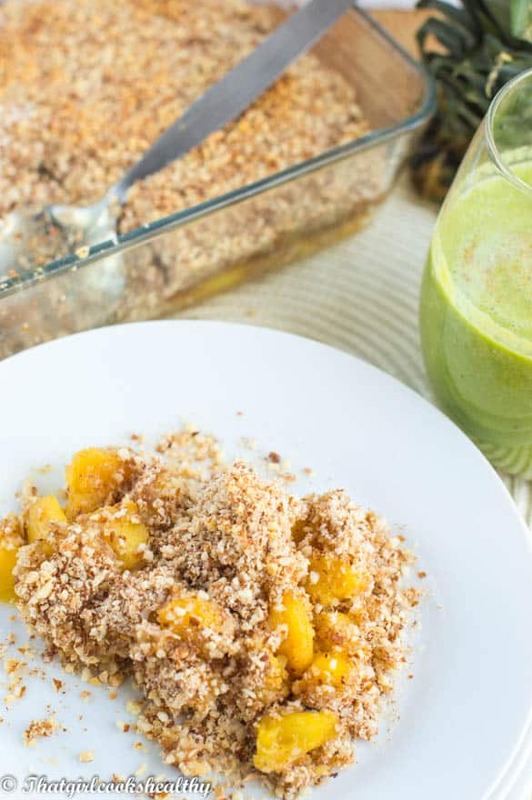 I had some mangoes laying around in the refrigerator for what felt like a long period of time. More times than not I usually incorporate mangoes into my smoothies or eat them alone. 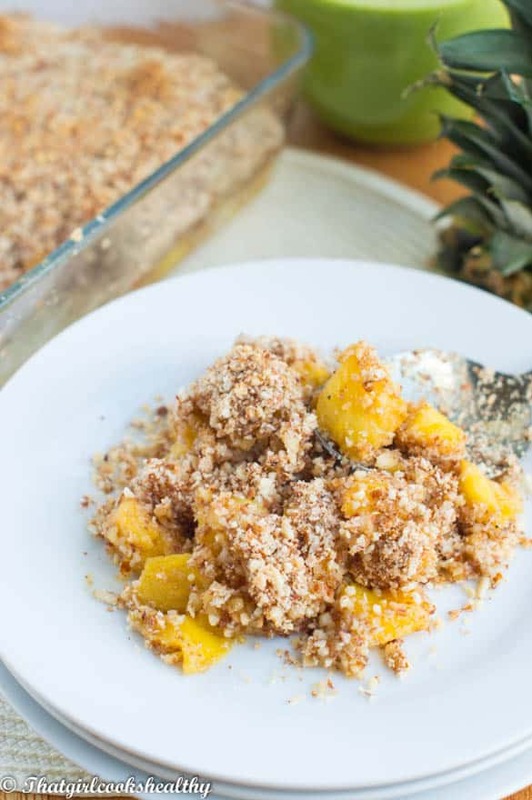 It was while I was out purchasing some groceries a fortnight ago when it dawned on me, that I should make a tropical based dessert for the blog and so a few weeks later the pineapple mango crisp would make an appearance. This innovative dessert has certainly impressed the family, don’t be offended if the chef doesn’t manage to sample a portion of their own food. Luckily I doubled the batch for some guests I had, so they were able to have seconds and thirds. You can suit follow and double, even triple the batch for guests. 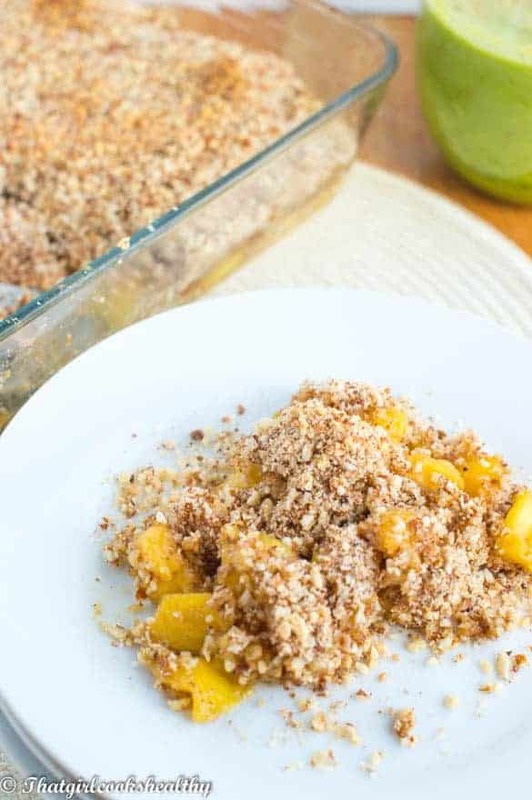 I cannot attest to whether this pineapple mango crisp is freezer friendly, not that you’ll have any leftovers to try it with. 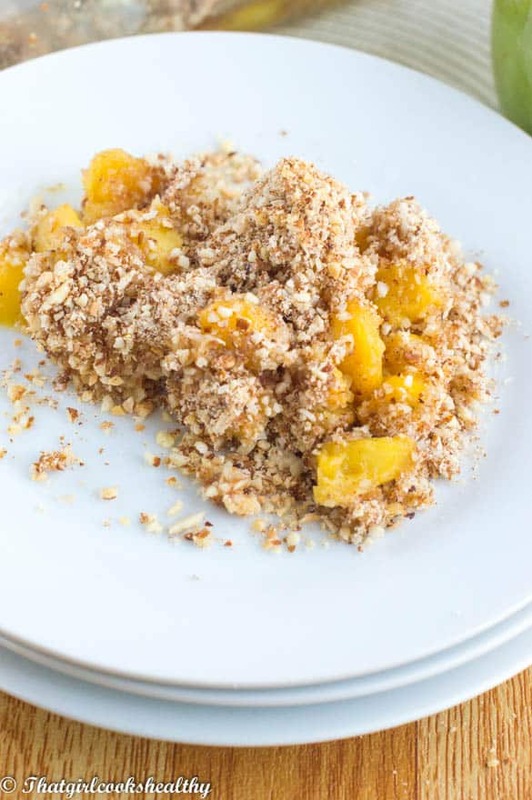 It’s so simple to pull off this recipe, we’re talking about peeling the fruit, allowing it to sweat in the saucepan with an assortment of spices (ginger and cinnamon). Then grinding the almonds with some shredded coconut and more spices (cinnamon, allspice and ginger) into a lovely topping. Then bake in the oven for 15 minutes, and hey presto! ………dessert is done. Start off by pouring the melted butter into a saucepan on low-medium heat with the coconut sugar. Stir the butter and sugar together, ensuring it doesn’t stick to the pot. Add the fruit, ginger and cinnamon, continuing to stir. Allow the fruit to sweat in the saucepan for 5 minutes. The aim is to absorb the flavours from the spices not caramelize the fruit, so 5 minutes is more than enough time. After 5 minutes set the saucepan aside and transfer the spiced fruit into an oven proof dish. Now prepare the topping by adding all of the ingredients for the topping to a food processor fitted with an S blade. Spread the topping evenly over the base, a thick layer if possible. Place the crisp in the oven to bake for 15 minutes or until slightly golden. Remove from oven and serve accordingly.